This page is for the original version. 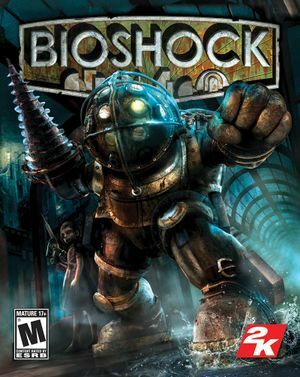 For the remastered version, see BioShock Remastered. 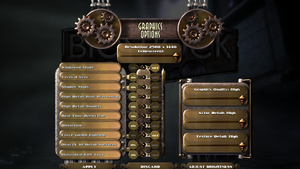 BioShock may crash on startup on Windows 7 and later. See Crash on startup. Physics and some animations are locked at 30 FPS. See below how to modify the lock. The retail version uses SecuROM DRM. There is no activation limit. An internet connection is required for installation. All Mac OS X versions, excluding the Mac App Store, use Feral Interactive's DRM system which requires online activation. All remaining Windows versions except GOG.com require Steam DRM. By default, physics and some animations are capped to 30 FPS. 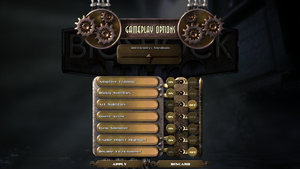 Open BioshockPhysicsUnlocker.exe, type your desired frame rate, and push ↵ Enter. 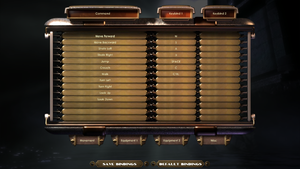 Allows you to change settings that are not normally adjustable from the options menu (i.e. custom resolution). Patch 1.1 - Steam version is already patched and the humblebundle DRM free version too. Requires Patch 1.1 for Hor+ FOV. Requires Patch 1.1 for Hor+ FOV. Must disable Horizontal FOV Lock or image will be stretched. Can be forced through the Nvidia Control Panel/AMD Control Center. Only in DX9 mode. Using flag 0x000010C1 also grants SGSSAA support. Physics and animations are locked at 30 FPS. See above how to modify the lock. No FPS or refresh rate cap. Make a backup copy of user.ini. Open the original copy and locate the keybinds by searching for "F10=". The game may automatically reset your FOV upon loading or after cinematics. You may still use your custom keybinds to change the FOV to your desired value. Process can be automated using this tool. Use inspector as per usual (open Bioshock profile, etc.) and change flag 0x00020000 to 0x0002002D adding a "2D" at the end. If you get issues you could also try it with a "23" at the end instead. Also if DX10 mode gives you issues you could replace the "02" in the middle of the flag with "14". See Mouse acceleration to disable. This mode hides most options menus. Must be turned on in the customize controls menu. You can download this small script in order to automate the process. Official localization by «1C-Softclub» – retail only. Patch for digital release here. In Arcadia, searching Langford's safe with the Scrounger tonic equipped will cause the safe's contents—including an essential quest item—to disappear. In Fort Frolic, leaving the area by using the bathysphere adjacent to the entry bathysphere causes the stage curtains to close upon returning to the area, rendering the Cohen's Masterpiece quest un-completeable, and preventing the player from accessing the exit bathysphere. When attempting to kill Silas Cobb, using the Hypnotize plasmid, as doing so will prevent a scripted task from triggering, thus trapping the player in Rapture Records. In order to fix this issue, you must kill yourself (e.g., through the use of the Incinerate! plasmid), or reload an older save. If your saves do not go far back enough, then the first two issues are game-ending. Technically, modifying the save file or using a trainer would also fix the issue, but neither solution has been documented. 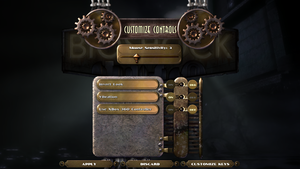 In properties, set bioshock.ini and User.ini to read-only. Additionnal changes to settings cannot be made while files are set to read-only. Process can be automated with an "if exist" batch script. Launch the game with -dx9 parameter. Find the following line, under [FMODAudio.FMODAudioSubsystem], and increase the number of channels. Go to %WINDIR%\System32 (or %WINDIR%\SysWoW64 for x64 OS's). Copy over wrap_oal.dll into the same folder where Bioshock's executable is located (steamapps\common\bioshock\Builds\Release\). Enable EAX audio in the in-game options. Find the following lines, and set the desired values. Push Alt+↵ Enter, before entering the Video Options menu. Set the desired resolution, then apply the changes. Leave the Video Options menu, then push Alt+↵ Enter again. Go to the NVIDIA Control Panel. Open the 3D Settings menu. Add Bioshock.exe to the list. Enable FXAA and V-Sync. 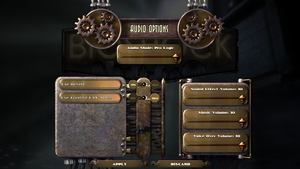 This should be necessary due to "somewhat broken MLAA"
Right click in the box and click "Show Disabled Devices"
Right click "Stereo Mix" and click "Enable"
In Windows 8 and later, Bioshock may have no sound, and it may be impossible to progress past the bathysphere scene as the NPCs become stuck and won't move. 3, 4 A shader model 2.0 hack is available here. Note that there were other attempts in the past besides this one though most links are dead, unfortunately. Known to run on Windows 2000 using the tricks listed here. Separate patch for the demo version found here. Requires an Intel processor. The game does not support Intel GMA integrated video chipsets (older Mac minis and MacBooks), but does run on GeForce 9400M graphics cards or better. ↑ 1.0 1.1 File/folder structure within this directory reflects the path(s) listed for Windows and/or Steam game data (use Wine regedit to access Windows registry paths). Games with Steam Cloud support may store data in ~/.steam/steam/userdata/<user-id>/7670/ in addition to or instead of this directory. The app ID (7670) may differ in some cases. Treat backslashes as forward slashes. See the glossary page for details. This page was last edited on 12 April 2019, at 07:25.